I like reviewing my finished projects at the end of each month. It usually shows me that I accomplished more than I'd realized (always a good thing!) and it's a gentle reminder of all the projects I never got around to photographing. 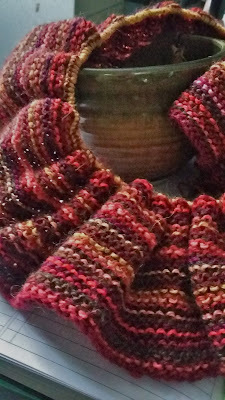 Even though I am THE worst photographer, I like having photographic evidence of what I've knit. Plus, having the photos cluttering up my desktop is another reminder to load them on to Ravelry. I finished knitting Antarktis and got her blocked. For some reason, my points curled but I'm okay with that. I actually like it when the points of a shawl curl. The curl seems to help the shawl hug me and keeps it from falling off my shoulders. 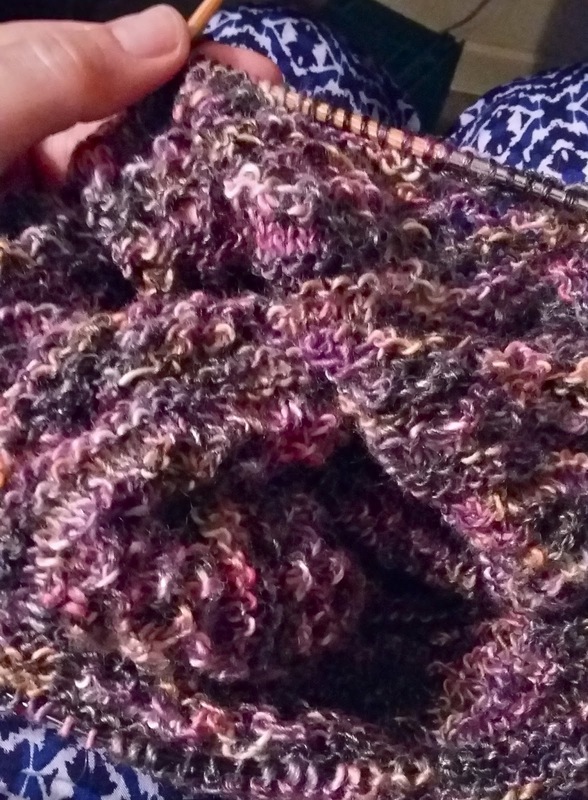 I just love her muted colors and think I'll get lots of wear out of this shawl/scarf. Assuming I can figure out how to wear an asymmetrical triangle scarf without looking like a cowboy-wannabe. I always end up looking like a bank robber from the Old West. Fashion is definitely not my thing. I finally got around to blocking my modified Reyna. If you take a look, don't pay attention to my Ravelry notes. They need major editing. I'd intended to turn Reyna into a semicircle instead of a triangle but Netflix must have gotten in the way and I ended up with a 'heart' shaped triangle instead of a semicircle. A huge, giant heart shaped triangle. No wonder this one took so much more yarn than expected! I still like it and think I'll wear it often, once again assuming it doesn't turn me into Bank Robber Cowboy Bob. I finished knitting the brown cowl. (I really need a better name for it.) This one turned out to be another reminder that I should always check my gauge before casting on. It's way too long. WAY too long. Instead of doubling it, I quadruple it around my neck. And it hasn't even been blocked yet. I still really like it though. 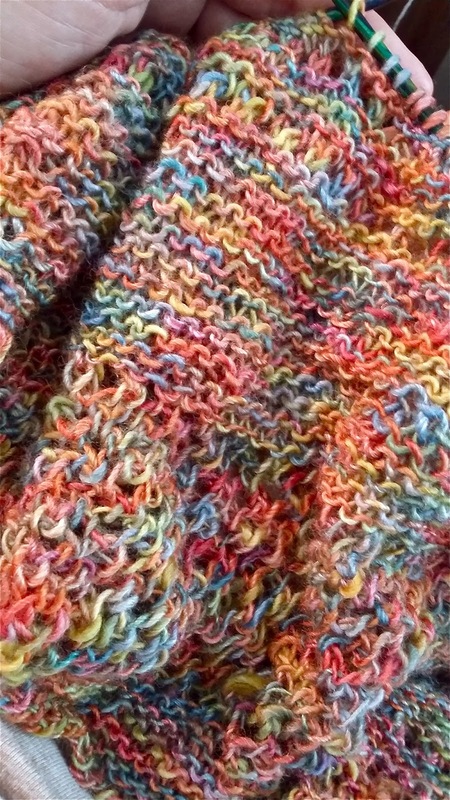 The yarn is so soft and fluffy and the open stitch pattern makes it light as a feather. Autumn Fire is coming along and I reached the six inches in width goal I'd set for myself. Hopefully it will grow another six inches in October. I started on my Christmas knitting. I've already frogged the green thing once and I may end up frogging the striped thing. I can't decide if I like the beads or if they were a horrible idea. And I started another hat for my shop. This one has a basket weave brim and will have a simple stockinette crown. There's no pattern for this one, I'm just making it up as I go. All in all, not bad, especially when you consider how many of these projects got frogged and restarted. And when you take into consideration the nervous breakdown I was having at the beginning of the month over the new job.... Not bad at all! And, I think I've finally settled into the new job. It's not so awful now. Talking over the radio still terrifies me but the rest of my duties aren't so scary anymore. I think I'll survive. Dammit! Now Gloria Gaynor is stuck in my head. It's here! Fall, it's definitely here. The killer Virginia humidity has left and in it's wake, we have rain. The State Fair is in town so we have more rain. And the occasional hail storm. We are experiencing those awkward temperatures where it's too chilly for shorts but you sweat to death if you wear jeans. I have a MASSIVE case of startittis. I want to knit ALL the things. Actually, that's not accurate. I want to start all the things. I don't really want to knit them, I just want to start them, toss them aside and have them magically finished the next time I look at them. It's not even October yet and I've already eaten so much candy corn I sort of never want to see another piece of it. And yet, I'll pick up two more bags of it the next time I'm at the store. And then there's nature's fall decorations. 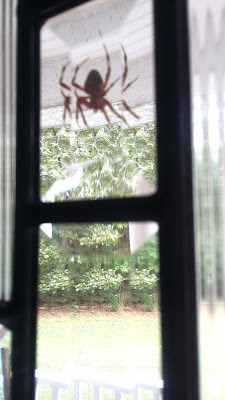 Our annual visit from Mr. Spider. 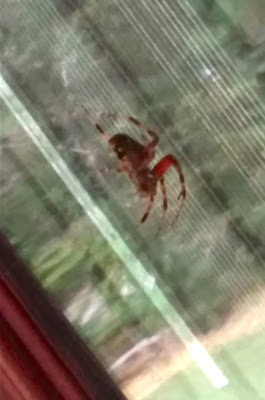 He usually spins his web across our front porch steps in an attempt to give the UPS man a heart attack. This year, probably due to the hail, he set up shop across our front door. Looking at him through the beveled glass on our door does not help the ick factor. And what is that spiky barb thing on his front leg? Do all spiders have spiky barb things on their legs? Eek! I'm not going outside until there's a foot of snow on the ground. Remind me again, why fall is my favorite time of year? It's Yarn Along Wednesday! Join me over at Ginny's to learn what other folks are reading while they knit. Me, I picked up Once Is Enough by Miles Smeeton yesterday. I'm only a few pages into the tale but I have high hopes. I've never met a disaster-at-sea story I didn't enjoy. Once Is Enough is the tale of the Smeetons' adventures of twice capsizing, dismasting and surviving the near sinking of their boat, the Tzu Hang. This happened to them twice! Twice! 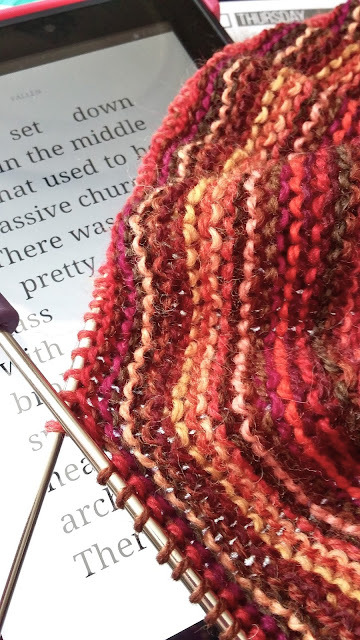 As for my knitting, I'm still working on the Autumn Fire super scarf and attempting to get ahead on the Christmas knitting. Hopefully the disasters of the Tzu Hang won't rub off on my knitting. I've already frogged the Christmas 'thing' once. Once is enough for me! Today's Yarn Along post is going to be short and to the point. 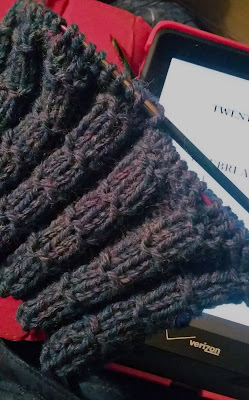 Yesterday I started knitting a broken rib hat and I'm still reading Fallen. At the moment, I'm not capable of telling you more about the hat. I'm typing this ahead of time, late Tuesday night. I just got home from my first ever full body deep tissue massage. What an awesome, painfully wonderful experience! I feel like I'm too stoned to speak and yet I'm so limber I can bend over and place my hands flat on the floor. I haven't been able to do that in years! 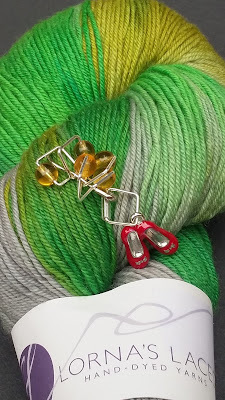 To see what others are knitting & reading, join me at Ginny's blog, Small Things. 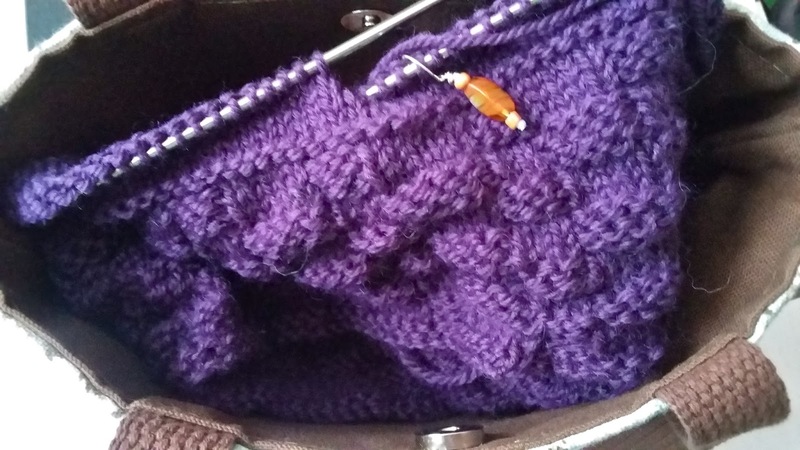 Although I only knit on my Autumn Fire scarf while I'm reading my email or catching up on others' blog posts, I've made some progress. And if you look closely, you can tell I've dropped it on the dog a few times. 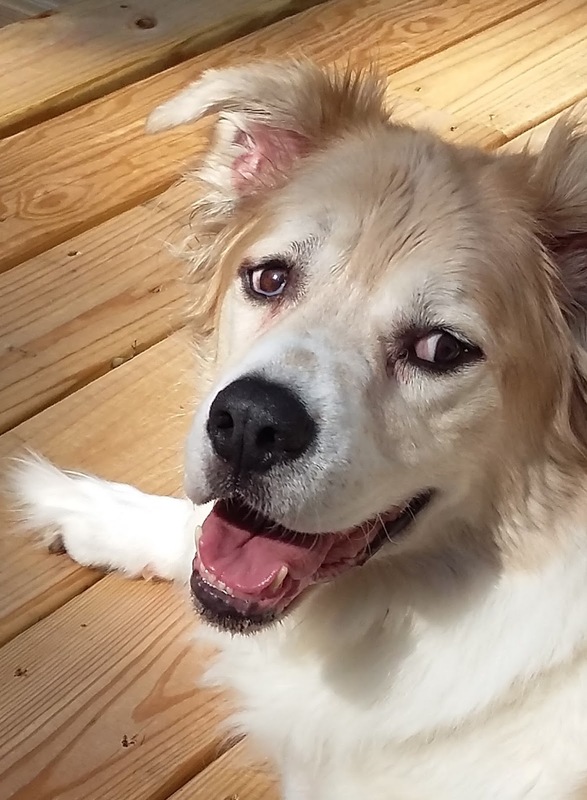 Max says, "No worries. I've got plenty of hair to share." I'm still reading Fallen by Lauren Kate. I'm enjoying the book but I just haven't been in the mood to read lately. That better change fast. I discovered a new, much closer 2nd & Charles bookstore. 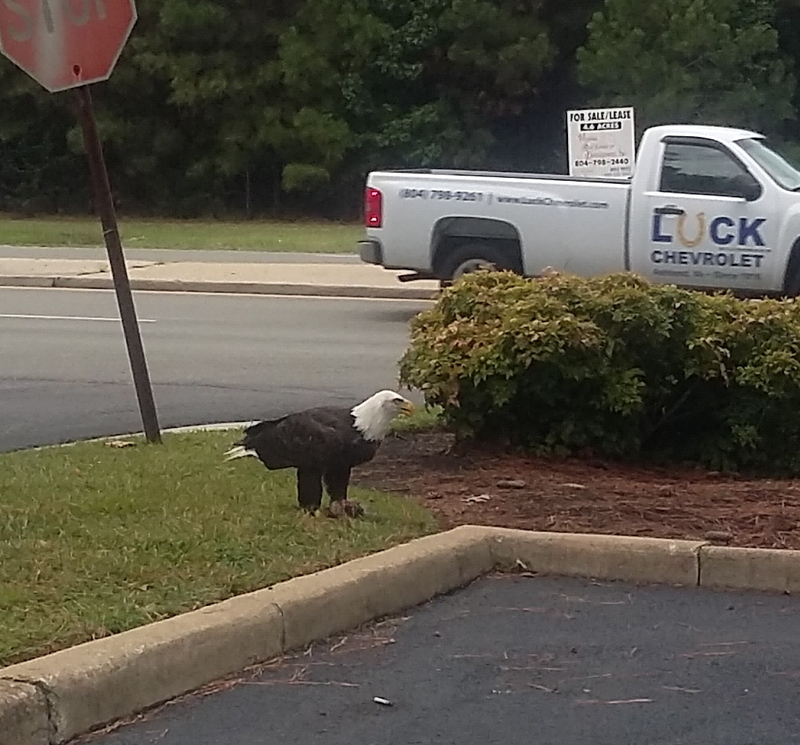 My daughter & I were out running errands last week and just happened to drive past it. The car magically made a U-turn all by itself and somehow, two giant bags full of books made their way into our car. Join me on Ginny's Yarn Along to discover what others are knitting and reading. Have you noticed my lack of communication lately? I've been on Code Red of the Terror Meter for last week or two. The terror level has been so high, I haven't even been knitting! Why? Because I got promoted to a job I had sworn I'd never take if they offered it to me. Don't get me wrong, I'm truly honored that they did offer me the promotion. Actually "offer" is not exactly the way it went down. It was more like, "We're making you the supervisor, as of well, now. So get on out there & figure out how to do the job." Not the exact words used, but pretty dang close. So I now find myself with a new shirt with "SUPERVISOR" plastered across my back (at work, you can tell everyone's level & department based on their uniform shirt, sort of like the military's stripe system) and many, many more gray hairs. I've had a few days to train and I've had the opportunity to actually do the new job on my own a few times now and I've decided to stand down from a Code Red to Code Yellow. I'm still terrified of having to use the radio and "10-codes" but I'm feeling more confident about all the other aspects of the job. Not 100% knowledgeable but I'm no longer in total can't sleep a wink sheer panic mode. The job isn't nearly as bad as I thought it would be. I'm down to Code Yellow mode. Like I said, I'm terrified of the radio. I have never had the ability to speak well under pressure and I just know I'm going to completely botch the 10-codes. I'm going to be like the dude who recently, and accidently, announced a "dead on arrival" code instead of the code for a bee sting. (And it was a normal bee sting, not even an allergic reaction bee sting.) I'm also really, really terrified that I'll get flustered and accidently curse on the radio. The penalty for that is actually much worse than accidently announcing someone's dead on arrival. The first time I had to use the radio turned out okay though. Everyone knew how nervous I was about having to use the radio and the first time I had to call someone on it, the entire office quieted down and after the communication was over (successfully, I might add,) they all clapped and cheered for me. You gotta love that kind of office support. As it turns out, I might actually enjoy the job. Well, I'll never "enjoy" the radio but I'll get used to it. Eventually. Eventually, like, near the end of next season. But hey, there will be a next season for me so that's a positive. And using the radio is just a tiny part of the job. That's another positive. 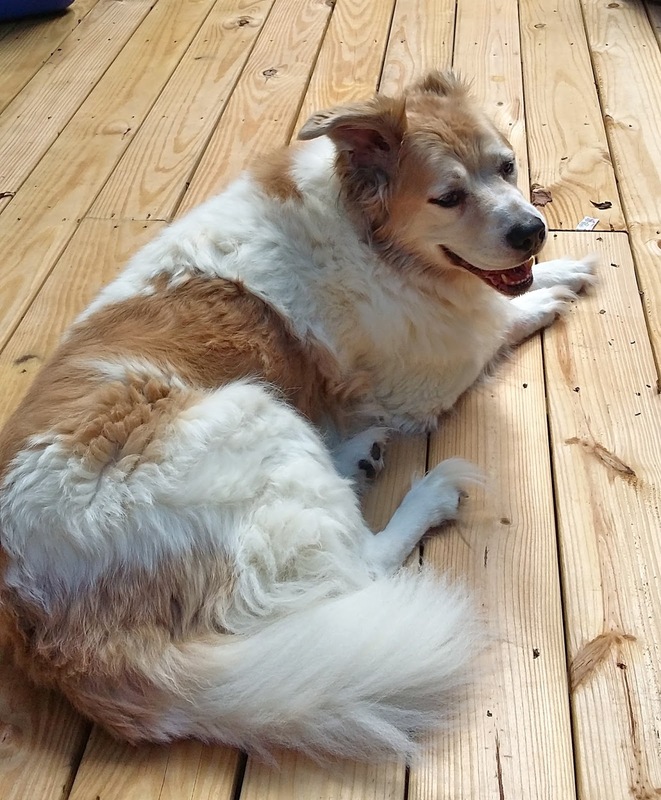 And while I may be 'stuck inside' for the full shift, I don't have to go outside and experience the thrill of Virginia's summer heat and humidity. That's a big plus. A huge plus, actually. And, best of all, three different strangers commented on my new, much grayer hair this past week. They all commented that they wished their moms' grayness was as pretty as mine. Weird but true, and flattering. I think. Phew! All that to say, I've calmed down enough to get back to knitting. I started a lacy, open stitch scarf. The yarn is Queensland Uluru and I'm enjoying knitting with it much more than I thought I would. It's a superfine cotton/acrylic/polyester blend with a slight fuzzy haze to it. Knit up, it looks almost like mohair. I'm not a big fan of knitting with cotton and just the mention of acrylic yarn gives me the heebie jeebies but this stringy looking yarn is knitting up into the softest, lightest weight, super snugly scarf ever. It's supposed to be a gift but.... If I manage to finish out this season without cursing on the radio, I just might gift it to myself as a reward. Max says, "Look, Mom. Your scarf matches my coat." I'm feeling slightly more patriotic today. 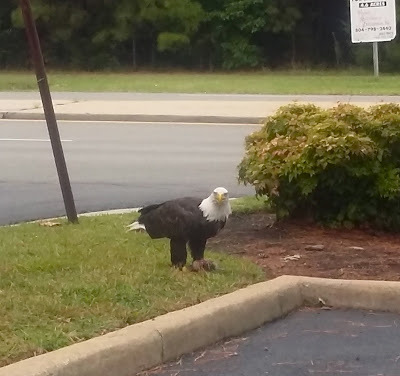 A huge bald eagle was on the edge of the parking lot eating his dinner. I just hope he didn't cause an accident because he was definitely getting noticed by the passing cars. In knitting news, I finished my Antarktis and even blocked it. Of course, I failed to photo it. That's on tomorrow's to-do list. Today, I'm hanging with my kids. I haven't seen my boy child in almost two months. It's difficult being a helicopter parent to an adult who no longer lives at home. It may be going back up to the mid 90's later this week but right now, and for the past few days, it's been in the 80's. Praise September! Labor Day has passed which means my job is a weekends-only thing for the next two months. Yesterday was the beginning of four days off for me. Four days in a row! Four whole days! Praise September! September means the grocery store aisles will be packed with candy corn. Yay!! September means fall and fall means knitting season. Okay, every day of the year is knitting season but September marks the beginning of serious knitting season. 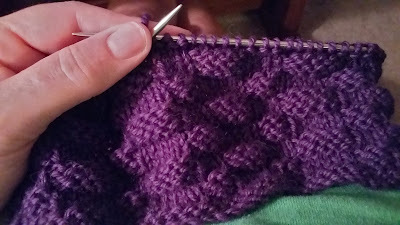 To honor the beginning of the new season, I started a new scarf/shawl/stole thing. My camera hates the color red and the photo doesn't do it justice. 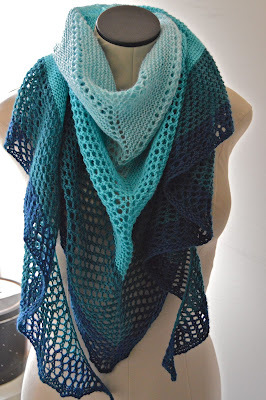 The plan is for this newest project to be a stole style shawl/blanket scarf type of thing. I cast on a gazillion stitches and for the width, I plan to knit stripes until I run out of yarn. We'll see how that plan goes. I've got twenty skeins of Knit Picks' Palette in the Fire Opal color group. There's no stripe pattern going on. I just keep the 'to use' and 'used' skeins separate. Once I've used them all, I start over. I've knit several others (this one and this one for example) in the past. I think this one is going to be my favorite by far. I absolutely love the mix of firey reds, golds and browns. I'm calling this scarf Autumn Fire. 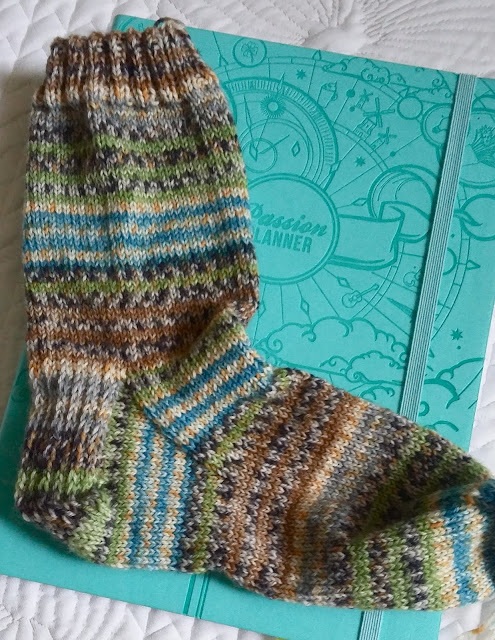 It's the perfect project to kick off September's knitting season. All that garter stitch involved in Autumn Fire also makes it the perfect project to knit while reading. At the moment, I'm reading Fallen by Lauren Kate. One of Ginny's fellow Yarn Along participants recommended it to me a week or so ago. I'm hoping that with four days off this week (thank you, September!) I'll be able to get lots of reading done. Reading and knitting. It is after all, knitting season!